OK, so having a baby now doesn’t give me as much time to do the millions of things I have swimming around in my head. But here’s a project I absolutely forced myself to carve out time for. The little guy is a big drooler at the moment (he’s almost 4 months now, so I guess teething is a thing that starts around now?) and he basically soaks through 2-4 bibs a day. 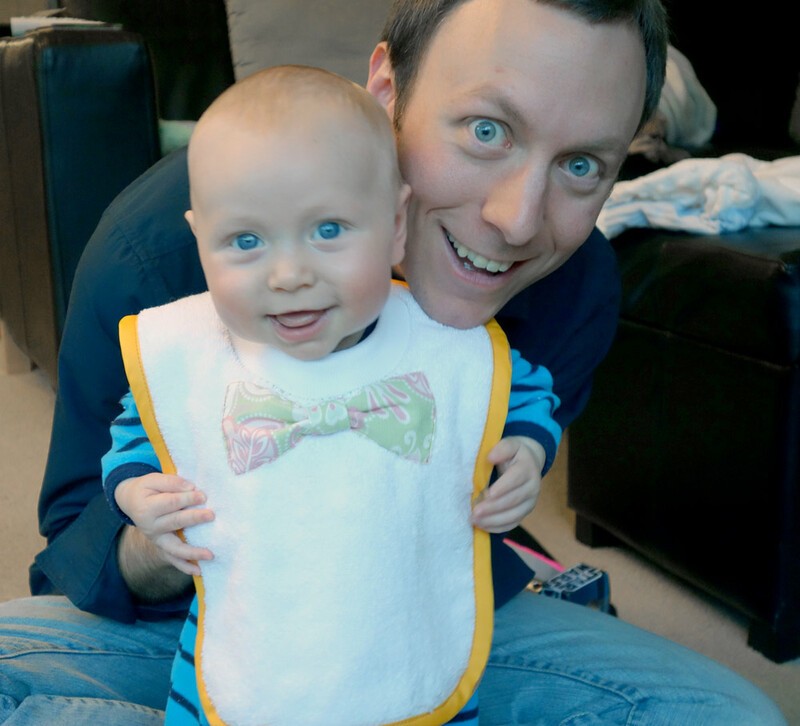 A lot of the bibs that he was gifted (usually as a set with a matching onesie) are teeny, and not really very useful. But two that we got were basically towels with a hole cut out for his head. Ah Ha. So I decided to try my hand at a cute version – with a bow tie! Perfect for those “special” occasions, ya know. (Seriously, with wedding season coming up, not to mention just fun holidays and stuff, this little extra detail will be my one effort to cute-en him up). Cut out the hole for the head. 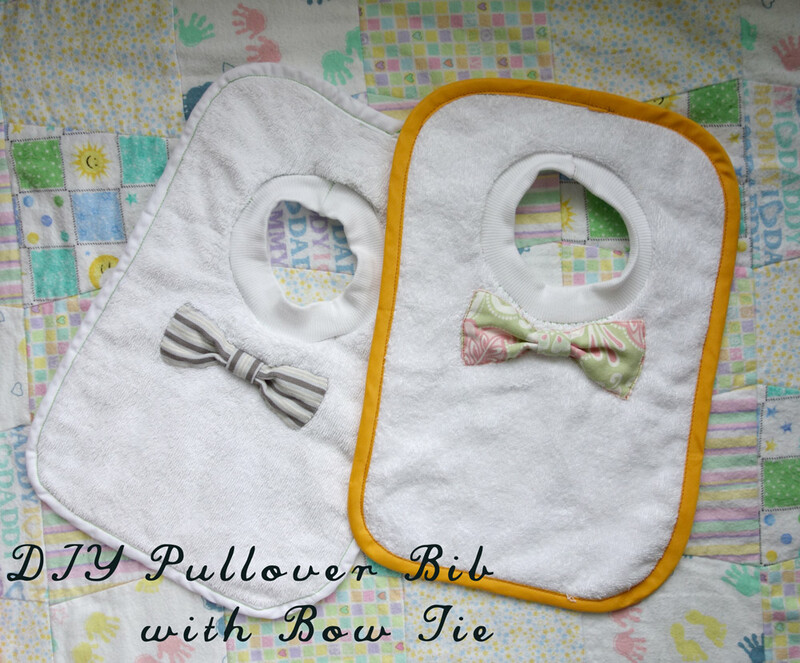 My babe is about 4 months, and I wanted the bib to be somewhat snug while still comfortably fitting over his head. I made the opening diameter 5 inches. 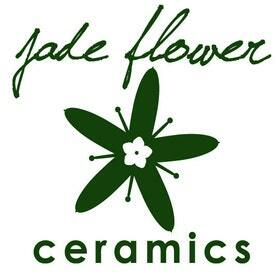 Positioned 2″ from the top and centered from side to side. 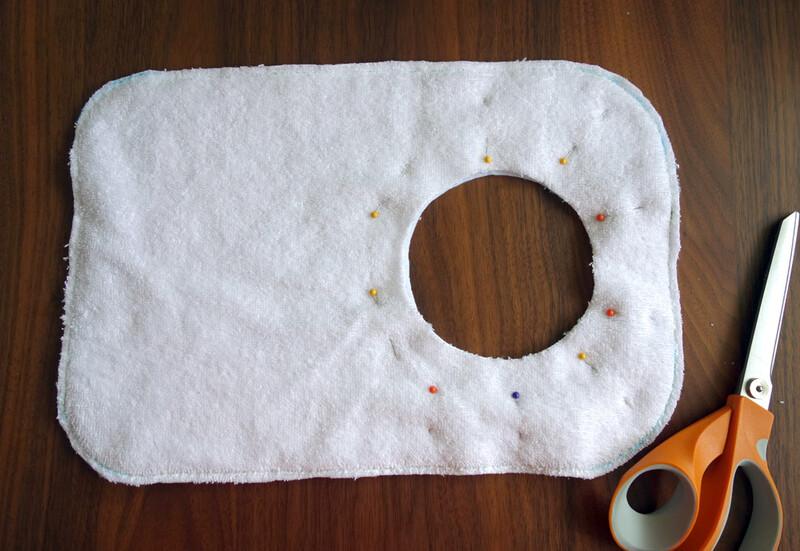 Pin together your two layers (right sides facing outward). 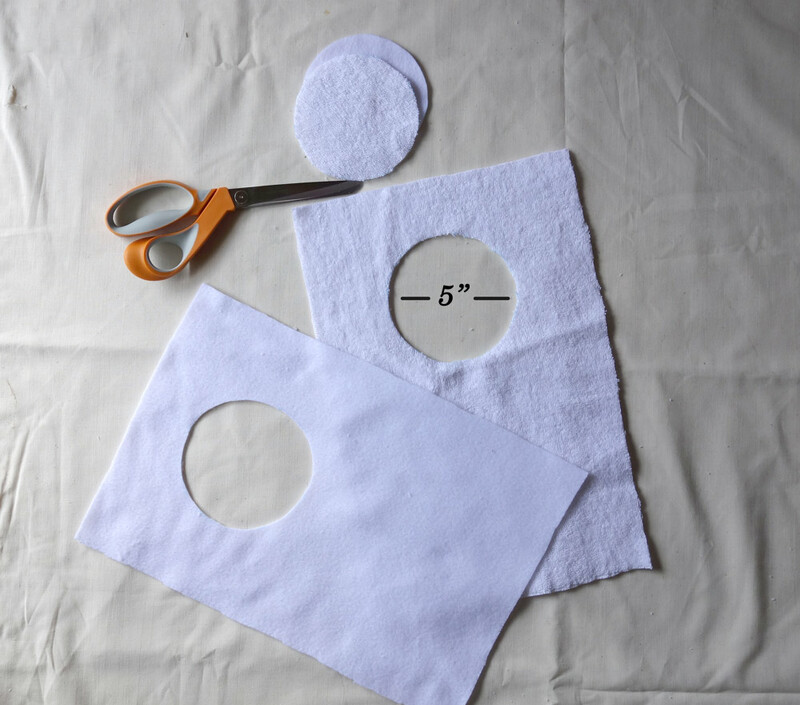 Sew a 1/4″ hem all the way around, and radius your corners (I used a light colored pen to mark the corners as a guide). 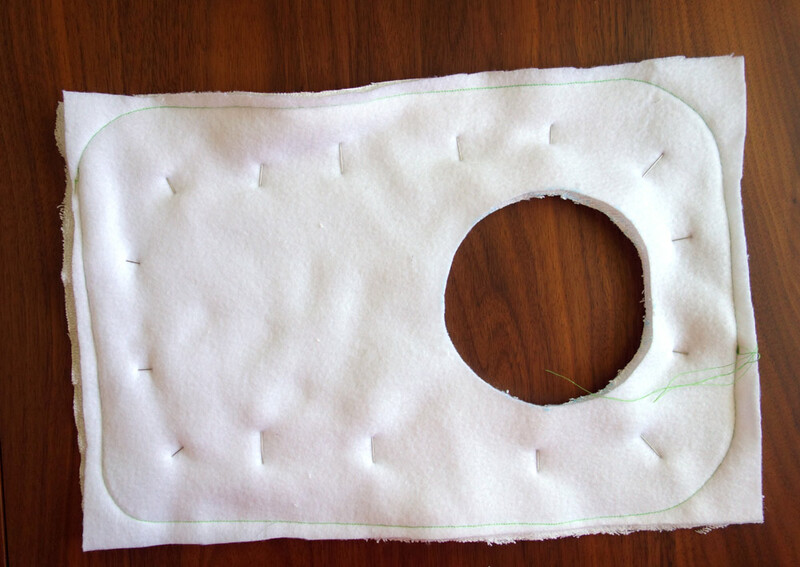 Trim your shape to about 1/8″ from your stitching. This will get covered up by bias tape later. Pin around the neck hole. Stitch on the bias tape! Cut a strip of knit ribbing 2.5″ x 11″. 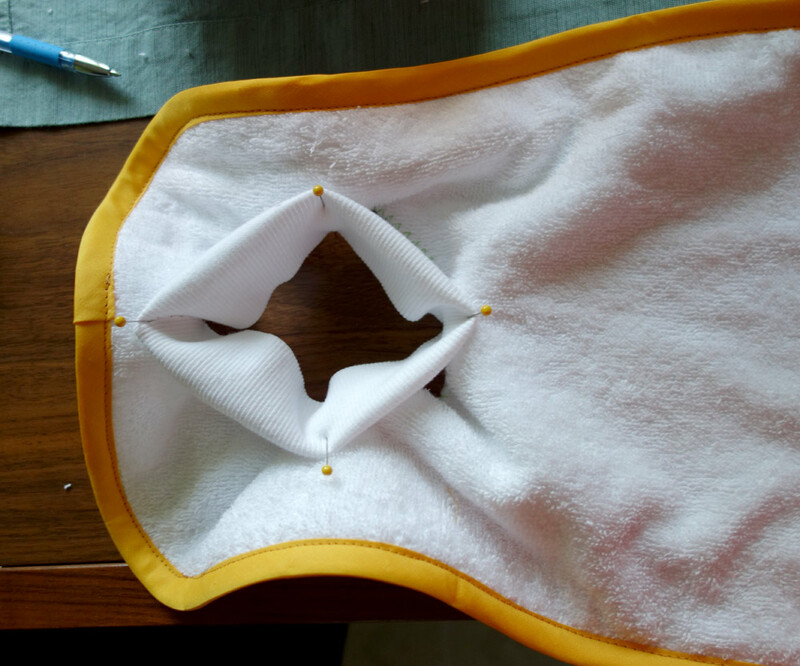 Fold it in half and sew the ends together with a V stitch. Then fold the whole thing over like a turtle neck. 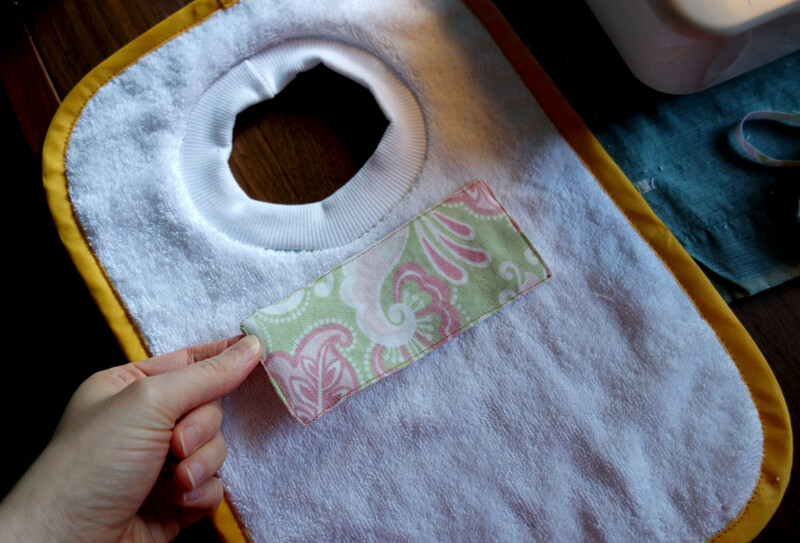 Pin the knit collar to the neck hole, matching the tops, bottoms and two sides. This will keep the stretch of the collar uniform. 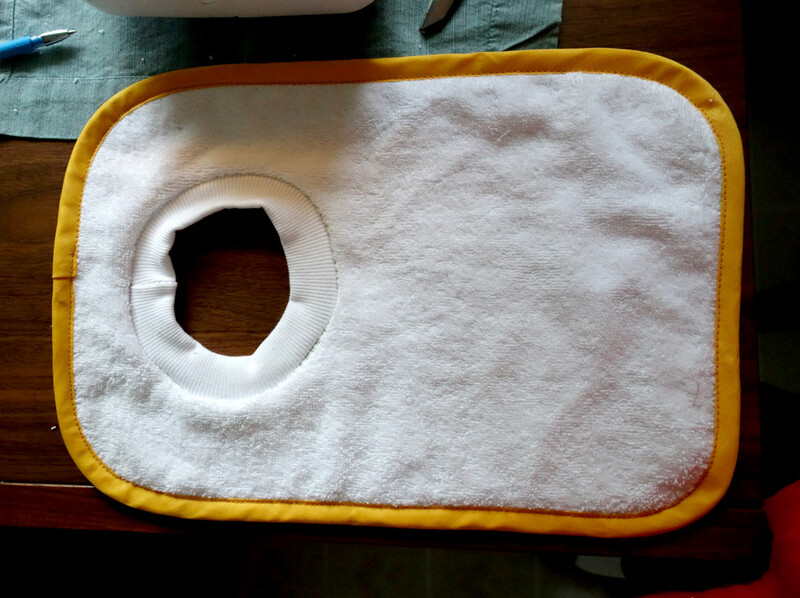 And there you have a functional bib! 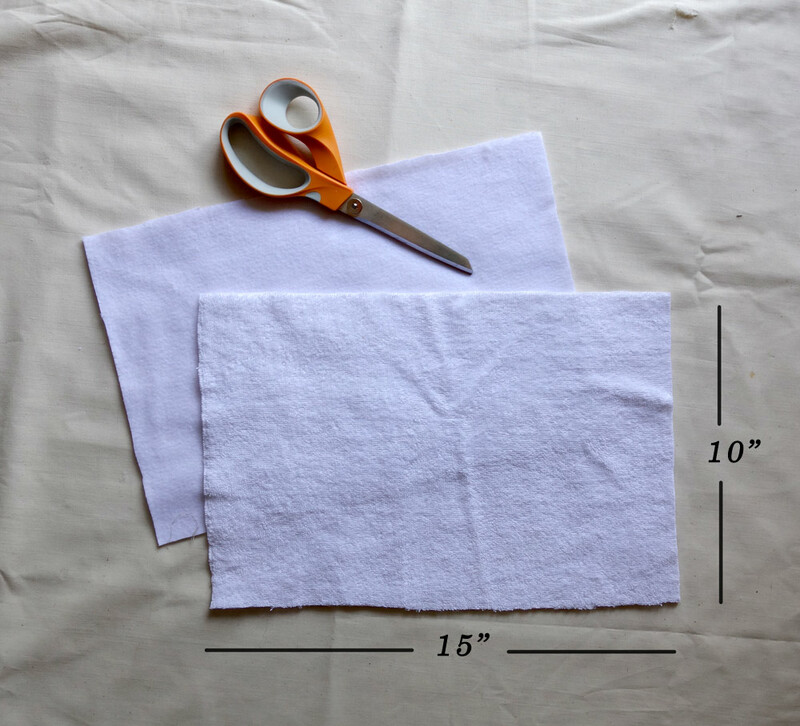 With your colorful fabric, cut a 5″ x 4.5″ rectangle. Fold lengthwise, right sides facing inward. 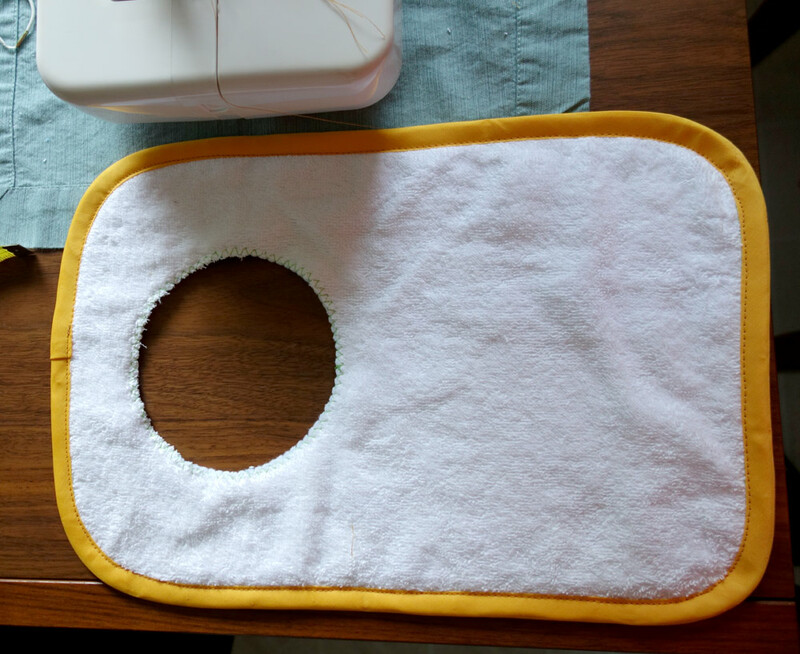 Stitch almost all the way around with a 1/4″ seam allowance, leaving enough of a hole to flip the rectangle right-side-out. 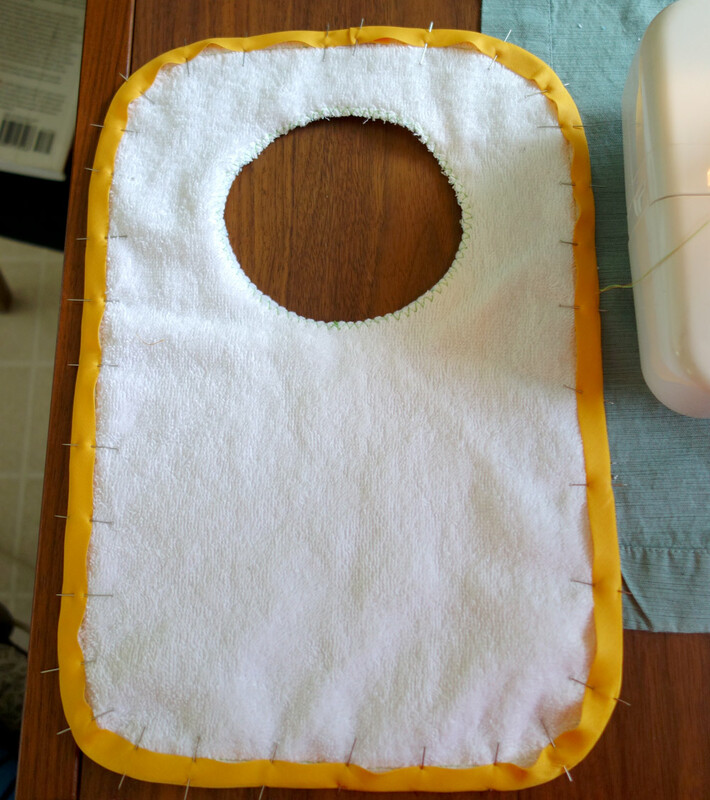 Once it’s flipped right-side-out, fold in your opening hole, and then stitch all the way around as close to the edge as you can. 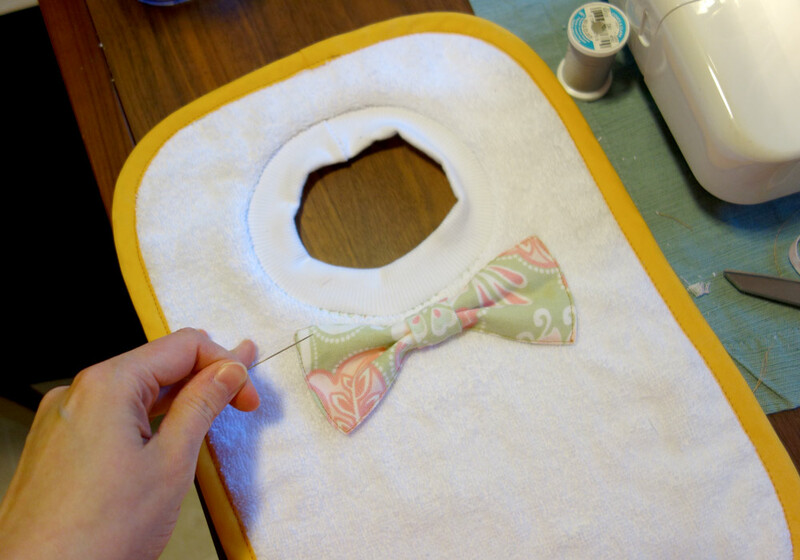 Sew a tube for the middle of the bow tie. I did mine from a long rectangle 2.5″ wide, giving me a 1″ strip when it was turned right-side-out. 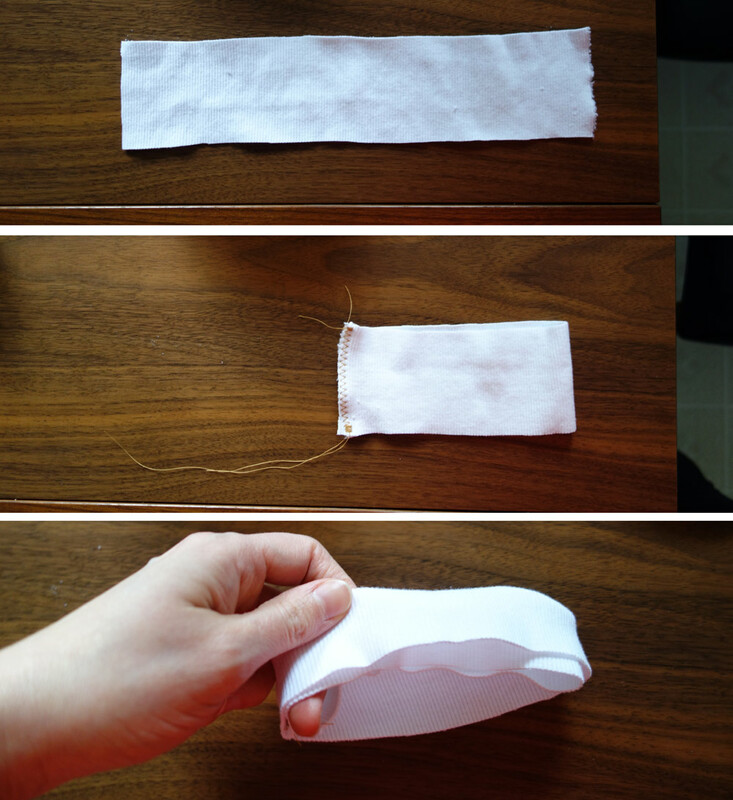 Pinch the middle of the big rectangle (like an accordion fold) and wrap the smaller fabric strip around it. 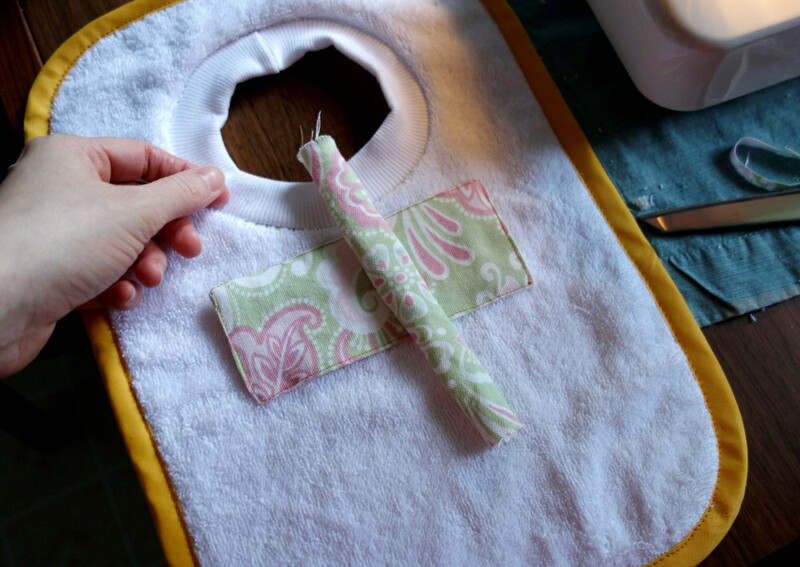 Trim off the excess from the strip, and stitch it into place. Now you have your bow tie! Position the bow tie pretty close to the collar and pin into place. 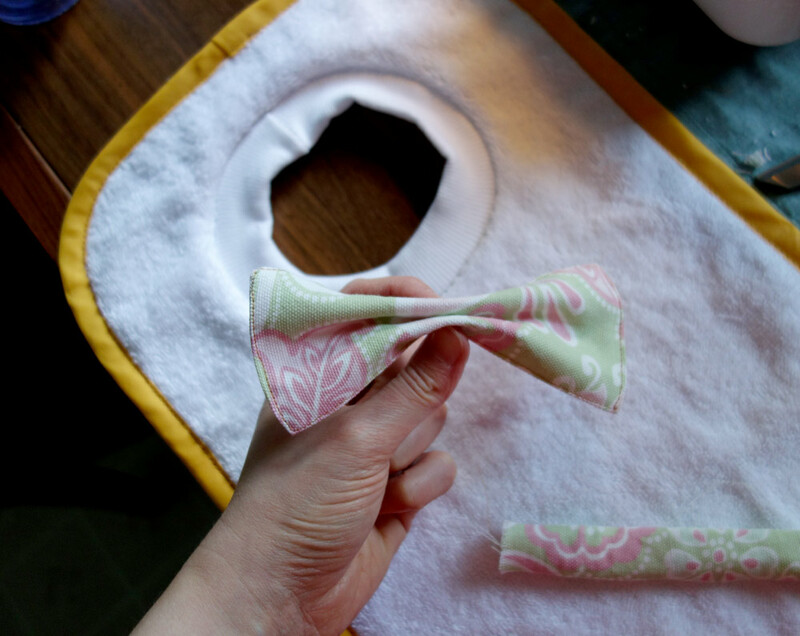 Hand-stitch all around to secure in place (this will keep little hands from grabbing loose edges and pulling the bow tie off, with their orangutan strength).